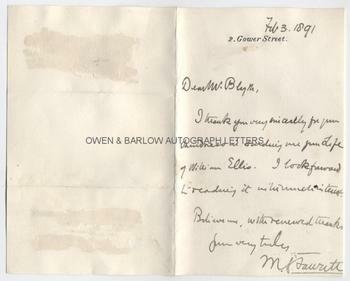 MILLICENT FAWCETT Autograph Letter Signed. Millicent Garrett Fawcett. British (English) suffragist, early feminist and campaigner for womens' rights. Founder of Newnham College, Cambridge. ALS. 1p plus integral blank leaf. 2 Gower Street. February 3rd, 1891. To Mr. Blyth. 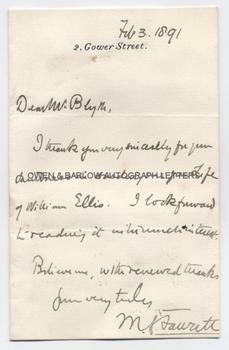 "I thank you very sincerely for your kindness in sending me your Life of William Ellis. I look forward to reading it with much interest. Believe me, with renewed thanks" [etc]. 8vo. Approx 7 x 4.5 inches. 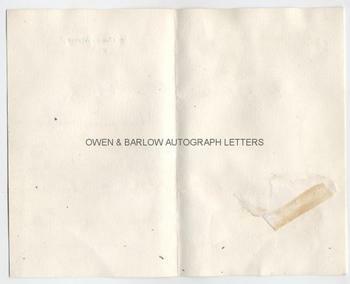 Part of flap of the original envelope adhering to integral blank leaf and with slight mounting traces to verso. All else fine. Millicent Fawcett is, perhaps, best remembered as a women's suffragist and campaigner for votes for women. She spoke at the inaugural London meeting of the London Suffrage Committee in 1869, an organisation which she had joined and was appointed as its secretary at the age of 19. She was president of the National Union of Women's Suffrage from 1907 to 1919 and did much to finally secure enfranchisement for women. She was also a staunch advocate of higher education for women and she founded the all-women college, Newnham College, Cambridge, in 1871. Millicent Fawcett was encouraged in her work by John Stuart Mill and it was he who introduced her to her husband, Henry Fawcett. Her work in other fields included heading the Commission that was sent to South Africa to investigate reports of the atrocious conditions in Boer concentration camps, campaigns to make child marriages illegal and reforms to the laws relating to prostitution and sexual offences. Provenance: From a 19th century album compiled by the Blyth family. Edward Blyth was a London Solicitor and a friend and advisor of Elizabeth Blackwell, the first woman to qualify and practice as a medical practitioner. Edmund Kell Ellis was the author of a biography of William Ellis, the founder of the Birkbeck Schools.